In the middle of summer when your skin has taken a beating from sunbathing, beaching or generally enjoying the great outdoors, it’s time to stop and pamper yourself with a refreshing, soothing and, most of all, nourishing treat. Olive oil (surprise!) is good for every kind of summer skin treatment – washing, exfoliating, moisturizing, soothing and beautifying. Olive oil soap is simply the best way to wash your skin. Even before soap was invented, when the Egyptians wanted to clean themselves, they spread olive oil on their skin (which stuck to the dirt) and then scraped it off. Other civilizations learned to put soda ash in olive oil and it became the first soap. 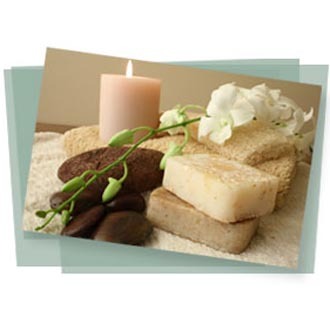 Because of its emollient and soothing effect, olive oil soap softens and moisturizes the skin as it cleanses. Today, you can find all kinds of soaps with combinations of olive oil and other natural ingredients that offer a texture and a multitude of fragrances to suit your taste. For sensitive skin types, The Olive Oil Source has a special line of organic olive oil-based soaps from Marius Fabre and Panier des Sens in France that are uniquely created to pamper delicate skin. Exfoliating is important in warmer months. Your body sheds skin cells at an amazing rate every minute of every day. If you don’t exfoliate, your skin can look dull and dry, no matter how much moisturizing lotion you use. For the face, I suggest a gentle exfoliate of sugar and olive oil. Mix a small amount of olive oil with ½ teaspoon of sugar. Apply to the face, being careful not to exfoliate under the eyes, and then rinse off. Exfoliate about 3 times a week to prevent clogged pores and promote healthier skin. For the body, I suggest a “not-so-gentle” exfoliant. Mix ½ cup olive oil and 1 tablespoon of coarse-grained sea salt. Massage your skin in a circular motion and shower. Slather olive oil – on the face and body. Use straight olive oil or olive oil mixed with your favorite lotion to moisturize after exfoliating. And, always moisturize before you go to sleep so that your skin can rejuvenate overnight. Olive oil nourishes and softens the skin. Why? Among all the natural lipids, olive oil has the most similar chemical distribution to human sebum (sebum is the body’s own natural skin lubricant). This similarity gives olive oil a strong affinity to human skin. Olive oil is completely safe, easily absorbed and has a cell “re-fattening” capacity. Olive oil will not clog your pores; it penetrates quickly, leaving skin soft but never greasy. Olive oil contains squalene which improves elasticity, vitality and tone and protects the skin from dehydration. For painful sunburns, olive oil can be used to help soothe your painfully reddened skin. While olive oil is not intended to be used as suntan oil, primarily because it does not contain any sunscreen, it can be of great help after one has experienced a sunburn. The following is a simple treatment for sunburn and even for the blisters that sometimes follow too much exposure to the sun: Mix olive oil with an equal amount of water. Beat until it becomes an emulsion. Apply to the affected area. For blisters, make a compress of warm olive oil and chamomile tea. Apply to the blistered area. If you find that a pedicure is not fixing the damage of days on the beach or in sandals, give yourself a foot scrub using 3 tablespoons of olive oil, 3 tablespoons of honey, 1 tablespoon brown sugar and a squeeze of lemon. Once the concoction is made, clean your feet with warm water, then rub the mixture onto feet, massage and rinse. Apply your favorite moisturizer (olive oil, of course) and notice how smooth your feet feel. We all know that gardening without wearing gloves can result in rough skin and torn nails. (Make sure you have your olive oil close at hand for moisturizing.) However, if you ever have an opportunity to harvest olives, you may not need that much protection. Picking olives without gloves can actually improve the skin. While gloves are useful, I like to pick olives with my bare hands for part of the time. Unlike regular gardening, my hands are soft and smooth afterwards. It’s almost like getting an olive oil rub from the ripe fruit. Just one more gift from this marvelous tree. No matter what skin treatments suit your lifestyle, summer is one of the best times of the year to make sure you take good care of every inch of your body. So, do yourself a favor and treat your skin to olive oil products for the body from The Olive Oil Source Boutique. It will thank you all year long.